A soccer player who was jailed in Thailand and faced being sent back to his native Bahrain, where he said he would be imprisoned and tortured, was released Monday after Thai prosecutors dropped the extradition case against him. On Tuesday afternoon, the player, Hakeem al-Araibi, arrived back in Australia, where he has refugee status. He was greeted at the airport in Melbourne by a swarm of well-wishers, who started singing, “You’ll Never Walk Alone,” a popular soccer anthem. Mr. al-Araibi, 25, who had been a star defender for the Bahrain national soccer team, fled the small Gulf nation in 2011 during a crackdown on Arab Spring protesters. He said he had been tortured by government security forces. He has been playing soccer for a minor team in Melbourne, Australia. 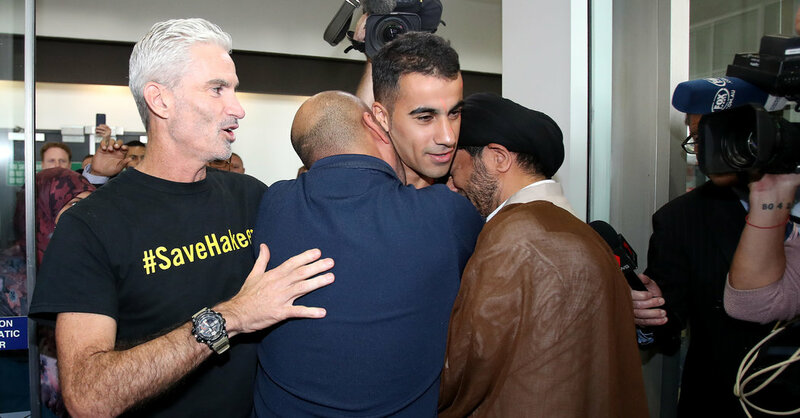 After his arrest in November at an airport in Bangkok, he became the focus of lobbying by diplomats, prominent sports figures and a social media campaign under the hashtag #savehakeem. Mr. al-Araibi left for Australia as soon as his departure was approved. Mr. al-Araibi traveled to Thailand last year for a honeymoon and was detained with his wife. She was released, but Mr. al-Araibi remained in detention as Bahrain pursued his extradition. He had been convicted in absentia and sentenced to 10 years in prison for charges including the burning of a police station, which he said occurred while he was playing in a televised match. The royal family of Bahrain, which is Sunni Muslim, has pursued an aggressive crackdown against calls for democracy from the kingdom’s Shiite Muslim majority, including a campaign of widespread arrests and many convictions on what human rights groups say are trumped-up charges. Thailand, which has been run by a military junta since a 2014 coup, has sent people fleeing political oppression back to countries including China, raising fears that Mr. al-Araibi would also be returned. Mr. al-Araibi received widespread support from the international sports world, including FIFA, the international body that oversees global soccer; the International Olympic Committee; and the World Players Association, an umbrella group representing 85,000 professional athletes worldwide. Jamie Vardy, a striker for the English Premier League club Leicester City, expressed support for Mr. al-Araibi on Twitter, and Craig Foster, a broadcaster and former captain of the Australian national men’s team, was a prominent advocate for his release. When Mr. al-Araibi arrived in Melbourne, Mr. Foster placed his arms around his shoulders. “To see him back here on home soil today speaks volumes about the character, the values and the pride that we have as Australians,” Mr. Foster said.